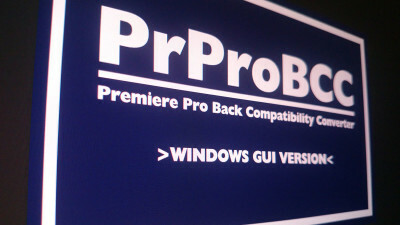 PProBCC GUI Converts newer Adobe Premiere CC Projects (from CC 2015.3 up to 2019.1 and later) to be compatible with Speedgrade 2015.1 or other older Adobe applications like AfterEffects. 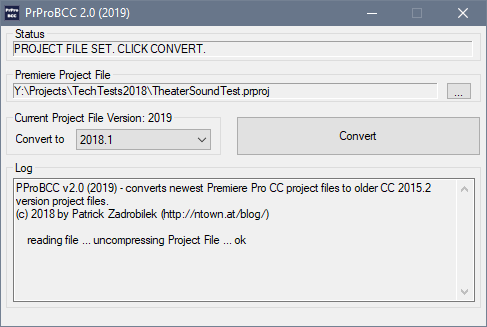 With the help of this tool a Premiere Project saved with the version CC 2019 and newer can be opened in Speedgrade (version 2015.1) to be graded, saved and reopened again in the newer Premiere version 2019.1 (and up). – The tool reads Premiere Project files (.prproj) and saves it with the version you need. – PrProBCC can stay opened while working on the converted file and (after saved in the old/newer Adobe application) automatically reloads and converts the given projevt file open in PrProBCC. – IMPORTANT (for Speedgrade): After the grading just convert it again in the PrProBCC converter back to the original file version format so it can be opened in Premiere 2019 without the notice of an older file format. The PrProBCC converter does the simple but important task to change the Version of the project file, but be aware that after grading and saving the project in Speedgrade, all special features like proxy clip assignments, Lumetri Panel adjustments from Premiere, etc. are lost during conversion. This will be addressed in a future update to PrProBCC. Also check out the successor of PrProBCC, AdApp Adobe Hack Tool with even more functions!